After a great morning exploring the castle and the Alfama, we went from the highest part of Lisbon back down to the lowest to catch the ferry to the other side of the river. 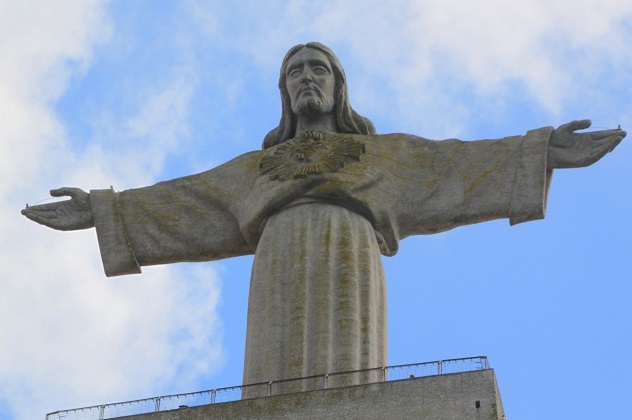 I had read all about Lisbon’s Christ Statue, we had a reasonable view of it from Commerce Square and it looked impressive but I was keen to get closer and see it properly. We picked a day when the weather was clear and bright and made our way to the ferry terminal. The ferries run about three times an hour back and forth across the river with more at rush hour. We enjoyed the fifteen minute ride and I loved the Lisbon views from the water. On the other side of the river and right outside the ferry terminal we easily found the 101 bus, bought our tickets and settled down for the twenty minute journey to the Christ Statue. The bus ride ends at the statue so no worries about getting off at the correct stop. It was seriously packed with people though, we had lucked out by getting on first and had seats. From the bus stop it is just a short stroll to the statue and you can’t miss it anyway, it is immense. 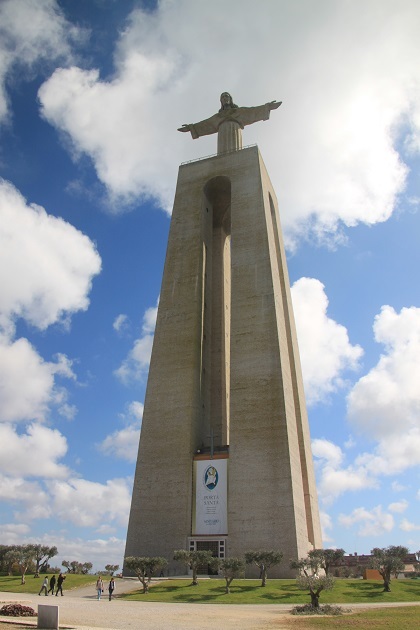 Erected in 1959 by the Portuguese people grateful to God for escaping involvement in WWII it was (clearly) inspired by the famous statue in Rio and both hold the same open arm position. 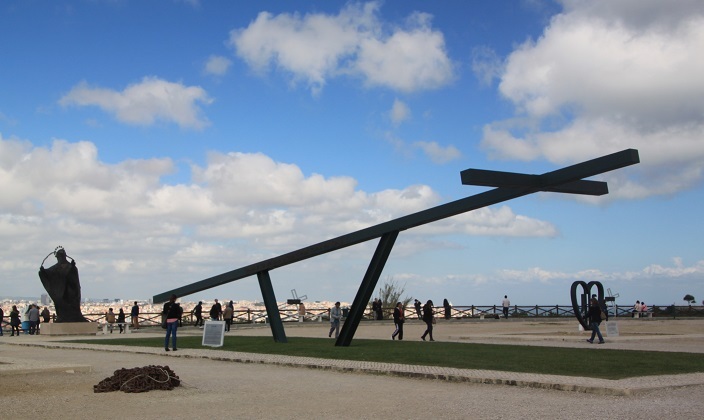 It faces the city of Lisbon on the opposite bank and symbolises Christ opening his arms to Lisbon. An elevator takes you right to the top, we chose not to do this, the lengthy queue put us right off. Anyway it was actually just as much fun to wander around the base, look more closely at the statue and take in those incredible views across the river to Lisbon. You also get a superb vista of the April 25 Suspension Bridge. It reminded us more than a bit of the Golden Gate Bridge. 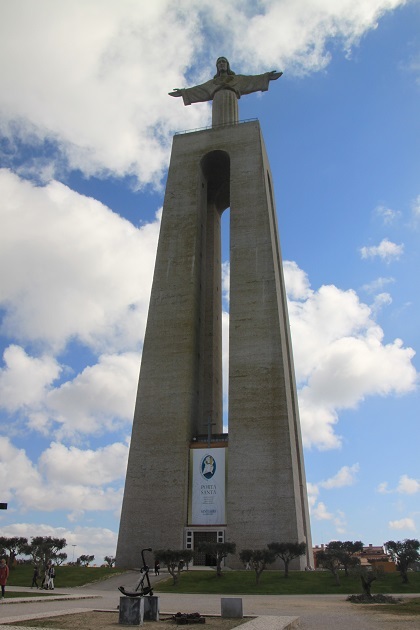 This beauty spans the river at its narrowest point and the name commemorates the Portuguese Carnation Revolution of 25 April 1974. It was noisy too with all the traffic – 150,000 cars on average pass over it every day. 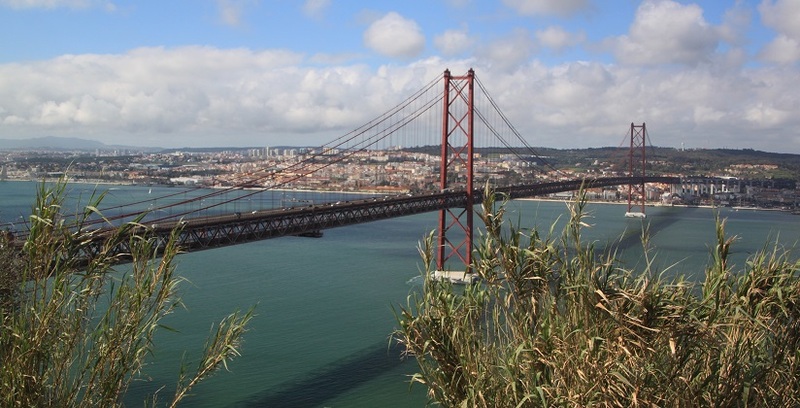 It is tall enough for cruise and container ships to pass underneath – an impressive bridge indeed. After all that it was back to the bus, back across the river and back to our hotel, ready for a rest to set us up for more evening explorations. Joy, what a great ferry trip with the views of Lisbon. The statue does look like the Rio one, and the bridge really looks like the Golden Gate! I was amazed by the statue and bridge and how much they looked like the one in Rio and San Francisco – never really heard about them before this trip as well Pam. They were beautiful. Thank you – it’s a very scenic ferry trip! 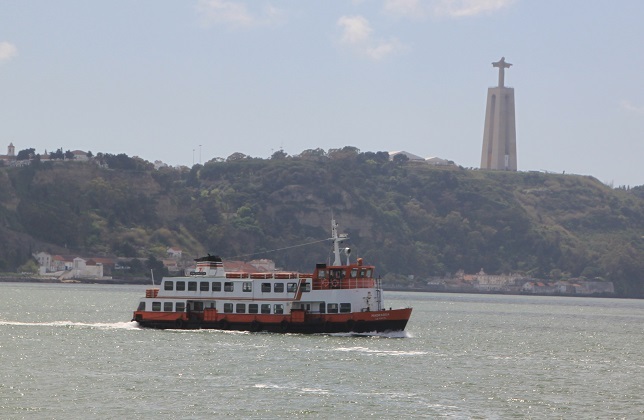 What a lovely way to view Lisbon from the water and to be able to see the statue up close. I really wanted to see the statue up close, think now we probably should have braved the queue and gone to the top but at the time we just didn’t feel like standing around for ages. 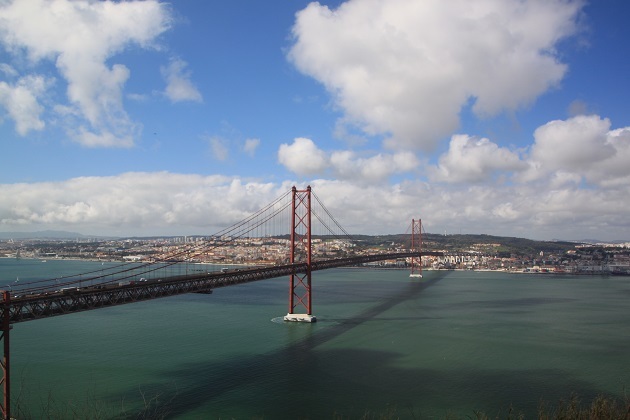 Still, we did get to see those incredible views, Lisbon really is gorgeous from all angles. Don’t think much of the statue but the ferry ride and the views look good. The views were incredible and nice to see Lisbon from another angle. Oh my gosh! It is very much like the Golden Gate Bridge! And the Christo is like the one in Rio! How wonderful to be able to see both in one trip! Thanks for the arm-chair tour. I thoroughly enjoyed it. Thank you for coming along!! I was amazed by how much the statue and bridge looked like their more famous twins!! Will be there soon so thanks for the tips! My itinerary is filling up fast. This was one of our highlights – great views from the ferry and then up by the statue you get to see the bridge so well. The ferry ride was fun, not too long and nice to see Lisbon from the water. I loved the bridge though – must have been good to drive across it. You’re right, that suspension bridge does look like the golden gate. I hadn’t heard of them before this trip either Rosemary but they are both spectacular and we loved this part of the trip. 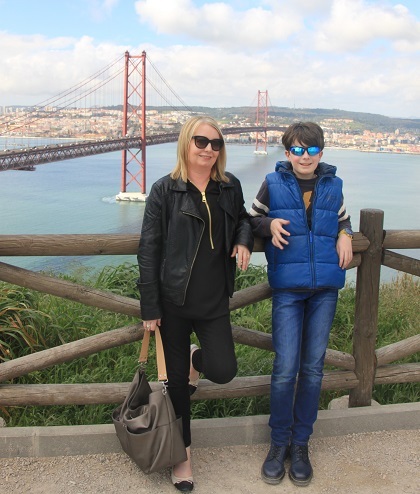 The ferry ride was great, a chance to have a rest from all the walking but still see Lisbon from a really different angle which was fun. Hope your weekend is going well! If I didn’t know you were in Lisbon and just looking at your picture, I would’ve thought you were at the Golden Gate Bridge! The ferry ride seems like something fun to do there. Thanks for “taking” us there! Thanks for coming along!! The ferry ride was really great, lovely views and a chance to have a rest in amongst all the exploring. One of my favourite parts of Lisbon! It took me 3 bloody hours to get there because I was unaware you could take this ferry in only half an hour, and instead I tried walking towards a massive bridge… yeah… then I had to walk all the way back to get said ferry as apparently I couldn’t cross the bridge with the cars. Good photos! That sounds like a bit of a nightmare!! A bit! Can’t complain though, was loving it despite how long it was, haha. I would have loved to wander around under that statue! Our guide pointed out that there are a number of replicas in Lisbon! The Christ statue, Golden Gate Bridge and even something that looks like Sacré-Cœur, Paris! That’s interesting about the Sacre Coeur as well Hilary – we didn’t know about that one! I can’t get over how much it looks like the GG bridge!! That’s the first thing that came to mind before I read your post! I know Corey, we thought exactly the same thing! I thought for sure that was the Golden Gate Bridge! I know – they really look alike don’t they! Thank you it is a lovely city. Just had a quick read of a couple of articles on your blog – loved them and will be back! We didn’t drive over it but I know what you mean! It is a beauty though. I did remind me of Brazil! We never got close but did drive across the Bridge and funnily our taxi driver said this is San Fran’s little brother! Haha for a second, I really thought that WAS the Golden Gate bridge and you were just confused! Nope, the confused one is me! They really do look alike – confusion is perfectly acceptable! !